Character Wipe Ability / Option for players to start fresh. Hello, I wanted to suggest a feature for a player to be able to wipe / start fresh with their characters. Now sadly I have not had the opportunity yet to look at the back end so I'm not sure how their stored and this might cause some issues as I'm new to the game and don't know how everything works. My suggestion is a simple nuke function somewhere in the game UI it can even for now be in say the Current Game Tab maybe a small button at the corner with Delete Character or Wipe Character. With a Extra Window the Pop's Up and Warns the User. Now this might be challenging since I have no clue what the backend looks like and I have a sad feeling each account has a Unique ID but not random ID created when they join a server... If this the case then I recommend some sort of dump / backup of the current character data then removed from the database. Because it's a Unique / none changing ID I would sadly leave structures and buildings alone as I would assume that would cause a lot of issues and I also assume it's backed in another file... But if it was not a HARD thing then what I would consider doing is giving it a NPC ID / Faction and let it because sort of an active ruin base, etc. I really can't help much on the backend and idea's as I have no clue how it works once I get my hands on it in the next update or further down the road I can edit this and give better feedback. Well I'm not sure how long games can go on for but I'm sure you can easily run a no wipe server and the idea you build up and become big and play for months or weeks. Now if you screwed around a lot or want a fresh start it would be awesome. For example I wanted to learn the basics of the game then start fresh and start video's. There is also maybe having a new name starting fresh maybe you were a jerk or had played with a bad group of people and there could be more for fresh start / name change (another thread). Re: Character Wipe Ability / Option for players to start fresh. I agree with you 100% regarding this. Even when there will be multiple servers later and you can just join another one I still feel there has to be an option to start from scratch. So it's certainly on our todo list and we are planning to implemented in one of the future versions (but probably not in A16 yet). Thank you for the detailed suggestion! 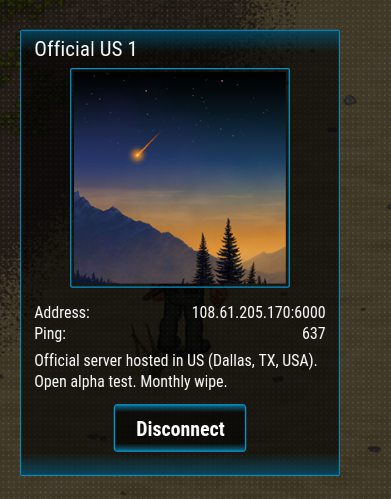 As for wipes - yes, eventually we'd like to see servers running for months without wipes, especially official servers. Yeah, I like this idea. I was actually looking for this function as well when I was new to the game and screwed up. Although, I'd like to suggest to keep the server wiping schedule and leave a leader board..
*forged the most weapons/armors (The Legendary Blacksmith) ...gunsmith? *and so on, so forth as for the hunters etc. if you wish to "tolerate".. bloody maniacs... which I really... seriously... don't want to be included in the leader board.. I don't know the end game yet, I haven't played that long, so I can't suggest a rank for it. No need for many types of rank. A few will do. Can also be overall. again, I really recommend on this game, CryoFall, that there should be a monthly wipe. My reason is, this is a PvP game. You'll never know when there will be a large group of war freaks to rule the game. War is inevitable. As in a shoe of a newcomer and felt this war blood in the air, thinking hopeless as how can I catch up anymore, I'll just say goodbye to the game with a sad mark on my face, because the game is great, but got owned and forced me out... and just find other game to play. Unless.. there's a chance for me to have a fresh start in a new round of the game ...and take my bloody and glorious revenge. If what I've said has been already discussed, please let me know. Apologies in advance, and I will gladly delete this message. EDIT: The rank for the most money. I changed my mind that all money should be in the player's storage. If what I've said has been already discussed, please let me know. No worries, we welcome all suggestions! And yes, we plan to keep the current schedule at least for the time being! Also, feel free to join our discord server as well - we have a lot of people discussing the game there!